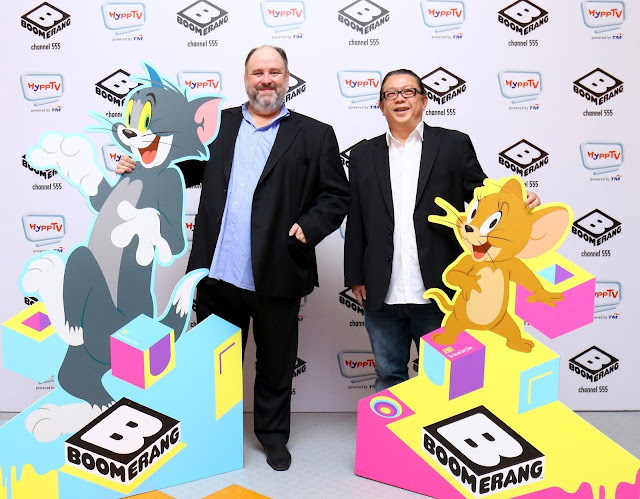 Telekom Malaysia Berhad (TM) via its award winning IPTV service, HyppTV, and Turner Broadcasting System Asia Pacific launched Boomerang, a global kids’ network. Now available to Malaysians via HyppTV Channel 555, Boomerang features a line-up of household names and contemporary cartoons programmed for both kids and their families. Available in dual languages – English and Bahasa Malaysia, HyppTV subscribers can tune-in from now until 30 September 2015 for a free preview of the channel. Boomerang offers exclusive, first-run content including new episodes of timeless favourites such as Tom and Jerry and Looney Tunes, as well as premium series including Garfield, Pink Panther and Pals, Strawberry Shortcake, My Little Pony, Inspector Gadget, and DreamWorks’ Turbo FAST and its two Dragons series: Dragons: Riders of Berk and Dragons: Defenders of Berk. Viewers can also expect a wave of new shows and new episodes of familiar favourites with fresh, premium content from shows like Wabbit, Mr. Bean and Be Cool, Scooby-Doo coming their way later this year! The new channel was launched by Jeremy Kung, Executive Vice President, New Media, TM and Mark Eyers, Chief Content Officer for Kids Networks in Asia Pacific, Turner International in a fun and colorful event held in Bangsar Shopping Centre. “HyppTV customers can also enjoy Boomerang’s fun cartoons via HyppTV with time-shift and catch-up functions or via HyppTV Everywhere mobile app which can be downloaded from Google Play Store, Apple App Store for smart device users and WebTV version for PC users,” he added. Meanwhile, Mark Eyers added, “Boomerang on HyppTV is the home for a cast of cheerful characters which includes Tom and Jerry, Looney Tunes, Scooby-Doo and Mr Bean. Its arrival in Malaysia powers viewers with premium content from some of the biggest animation studios in the world, including Warner Bros. Kids and their families will simply love the line-up.” Boomerang is available on HyppTV Channel 555 in High Definition (HD) format at no additional HD fee, and will be available for subscription starting 1 October 2015 with an ala carte option at RM9 per month or with HyppTV Jumbo Pack at only RM63.60 per month.